Myrtle Helen Jentz was born on December 17, 1935, on the Jentz farmstead in Tyrone Twp., Le Sueur Co., near Henderson MN. She was the oldest daughter of Ernest and Edna (Gregor) Jentz. A sister, Ethel, joined the family about two years later. Her early years were spent on the Jentz farm until their mother died in 1940 when Myrtle was only five years old. After her dad’s marriage to Hilda Wiest in 1941, the family moved to a farm west of Le Sueur near Rush River in Sibley County. Myrtle was baptized on April 2, 1936 at St. Paul’s Evangelical & Reformed Church parsonage in Henderson, and confirmed on May 29, 1949 at Trinity Lutheran Church, Sibley Twp., Gaylord, MN. At Trinity, she served as Sunday School Secretary and taught some of the younger Sunday School classes for several years. She participated in monthly Bible studies of the women’s group, and was active at worship. She also was a member of the Rush River Extension Group and the Birthday Club. She attended country school at Rush River District #7 (Sibley Co.) through sixth grade, and Le Sueur Public School through her junior year. Her high school education was completed by correspondence, and on November 19, 1968 she received her diploma from American School in Chicago, IL. Myrtle loved the farm. She participated in farm work and helped care for animals such as sheep, chickens, ducks, and geese. She milked the cows by hand, and assisted with threshing, harvesting, and haying. Being the oldest of five children, she helped care for her younger siblings. She knew how to help on the farm, and also enjoyed vegetable and flower gardening, cooking, baking and canning. Probably some of the least enjoyable jobs were butchering and cleaning ducks, chickens and fish. Showing her young nieces and nephews the tricks of the trade when they came to visit was a special joy. In addition to working on the farm, she was employed as a dietary aide/cook at the Minnesota Valley Hospital and Care Center for almost 40 years. A dedicated hard worker, Myrtle always gave her best even if working conditions were poor, and was always willing to fill in for coworkers. Despite rheumatoid and osteoarthritis that took a toll on her body, she continued to work until she couldn’t. She was also employed for the Green Giant Company and helped Ivan Schultz during the harvest season, as well as caring for her father during his later years. Fishing was a favorite summer pastime until mobility prevented her from doing so. She enjoyed traveling to various parts of the United States with travel groups, sewing, knitting, embroidering dishtowels and other items, and tearing old garments into rags for rugs. 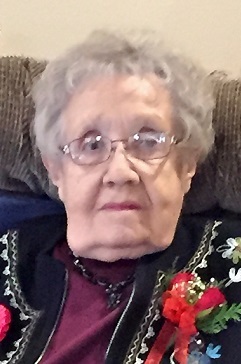 She also enjoyed reading newspapers, watching TV game shows and shows from earlier days of television were also her passion, and she faithfully listened to worship services, news and the Minnesota Twins on the radio. During her years at Comfort Residence, she especially enjoyed their activities for the residents such as Bingo, Pokeno, Art and Barb Straubs’ nature programs, and Bible studies. Never marrying, Myrtle supported children through International Compassion for many years. Companion animals, including several of her own dogs, held a soft spot in her heart. Snoopy, Ginger and Abby all preceded her in death. She supported various humane societies also. The time she spent with family, neighbors, and fellow church members was very important to her. She developed lifelong friendships through her work at the hospital/nursing home and at the local restaurants where she occasionally enjoyed coffee or a meal, and at her assisted living home. She was a “walking history book” and had great knowledge and interest in family connections. Myrtle worked hard. She was a strong, independent, frugal person who knew who she was and what she wanted. She purchased her first home in 1986 at the age of 50. Myrtle assumed household responsibilities after her stepmother’s death in 1964. When her dad’s health required more care, she quit her job at the Le Sueur hospital/nursing home and lovingly cared for him for many years. After his death in 1981 she returned to her dietary aide job. She cared more about others and helped wherever she found a need. Myrtle was preceded in death by her biological parents, Ernest and Edna (Gregor) Jentz; stepmother, Hilda (Wiest) Jentz; brother-in-law, Lowell Johnston; and grandparents, August and Emma Jentz, William and Caroline Wiest, and Louis and Wilhelmine Gregor. She is survived by her sisters, Ethel Johnston, Carol (Tom) Jackson, and Lois (Ken) Ahntholz; brother, William (Barb) Jentz; nieces and nephews; grand nieces and grand nephews; cousins, and many friends. Myrtle died on November 27, 2018 at the age of 82 at Comfort Residence, Le Sueur. Her life will be celebrated at Trinity Lutheran Church, rural Gaylord, on December 8 at 11:00 a.m. Interment will be in the church cemetery. Visitation will be from 3:00 to 7:00 p.m. on Friday, December 7 at the Kolden Funeral Home in Le Sueur and 1 hour prior to service time at Trinity Lutheran Church. Memorials are suggested for Comfort Residence Activities Dept. (105 Plum Run, Le Sueur, MN 56058), Trinity Lutheran Church (32234 – 431st Ave., Gaylord, MN 55334), Blue Earth-Nicollet County Humane Society (1250 N. River Drive, Mankato, MN 56003), or Ney Nature Center (P.O. Box 93, Henderson, MN 56044-0093). Special thanks to the staff, volunteers and her family at Comfort Residence for their compassionate care and friendship during the past several years.